WHAT IS THE CIU FUND? The CIU Fund is comprised of annual gifts from CIU’s loyal alumni, friends, parents, students, faculty, and staff. These gifts provide student aid, faculty salaries and the ability to undertake critical new initiatives while maintaining a distinctive CIU education. Your gifts make a difference every day in the life of a CIU student! Annual gifts to the CIU Fund are critical to an exceptional CIU experience. Tuition is the main source of revenue but it only covers about 60% of what it actually costs to provide a CIU education and the CIU Fund bridges the 40% gap. You may be able to tell by this student’s name that he comes from the country of Ukraine. He’s Vladyslav Hruntkovskyi, better known around campus as Vlad. His host family in Charlotte, North Carolina has been very supportive of his enrollment at CIU, and God even led them to help pay for his room and board. However, every year Vlad has also applied for donor scholarships to assist in the remaining costs. “There is absolutely no way I would have been able to afford education in the States on my own” is Vlad’s message to donors. 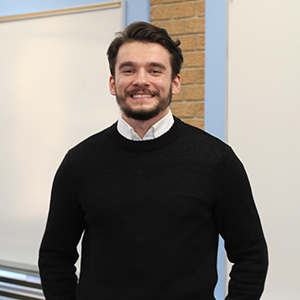 In addition to great classroom education, Vlad says he has met his best friends at CIU and together, they are passionate about impacting the world for Christ. For the immediate future, Vlad is considering a few options: an MBA, serving with Operation Christmas Child or taking a ministry position at his church back home. Long term, he desires to serve the Lord in his home country or be involved with a ministry that serves there.